Andrew the driver of our off road adventures and on road travels – he loves his 4×4 mostly for the ability to go places he loves (anywhere bush or outback). Andrew is the navigator and master planner he loves reading the ‘old school’ paper maps and following our trails on the satellite navigation system too and spends hours reading, researching and planning where to next. Also whilst school on the road is in Andrew is the laundry attendant – a fair deal! 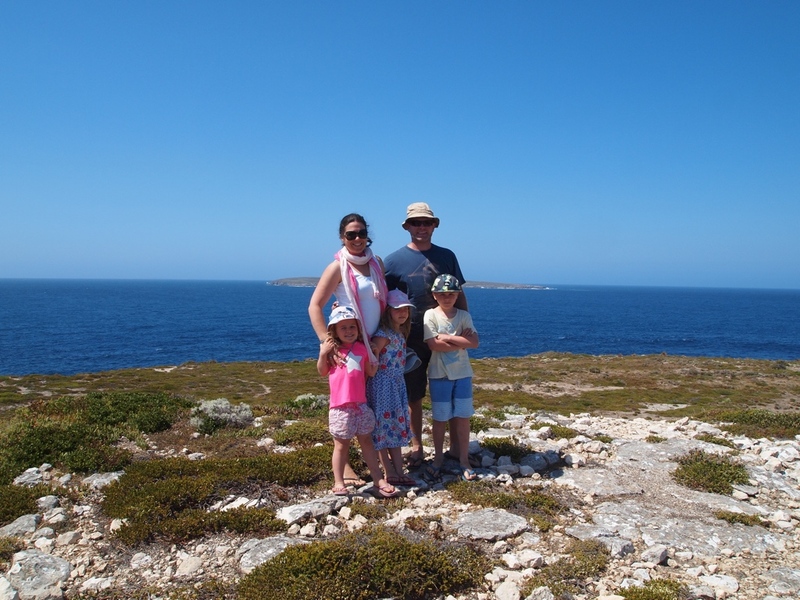 Andrew is a builder in his work life and has always wanted to travel around Australia overland. Being self -employed for the last 20 years he considers this his long service leave plus a few extra weeks! Did I mention Andrew loves holidays! Andrew is passionate about the outdoors (thanks to his Dad taking him on many adventures as a young boy/man) and seeing all of Australia has been a long held dream. Andrew loves camping and being with the children, teaching them, having fun and sparking the same passions about the out doors in them. He was the proudest dad when on a trip in the Victorian High country Aaron said “whoa that is awesome” looking out across the bush on a high country track. Michaela the chief food organiser cook, get anything and everything for the children and driver whilst travelling (because the driver can’t), the in car DJ, the leader of most in car games, the arbitrator of issues in the back seats and on this trip the ‘school on the road’ home-school teacher. Michaela loves cooking and will be testing the camp oven capabilities on this trip. Michaela also loves running, walking or hiking anywhere out doors. Michaela is an accountant and has had to take a career break to enjoy the trip. Working and juggling daily life it is always hard not to feel like you are missing out on precious time with the children. This opportunity to spend extended time with the children is both a luxury and a privilege – Michaela’s Mum once said not log after the birth of a grandchild enjoy them as babies and children they are on loan to you and before you know it they will be their own person off in the world. Michaela is especially looking forward to sharing time and memories with the family and watching the children grow and learn. Aaron is a typical eight year old boy who loves traveling anywhere with his Dad, loves riding his bike, swimming and climbing. Aaron is excited about getting to see more of Australia and is looking forward to snorkeling and swimming with dolphins. Aaron is only worried about missing his basketball team and to getting to ride his motorbike for so long. Aaron is a protective big brother and always helpful around the camp especially collecting wood and setting up the campfires. Holly is a very girly girl from day to day and always wants to wear a dress but enjoys getting out and camping too. Holly loves reading writing and drawing. This holiday will provide many opportunities to see and write about lots of new things. Holly loves singing, riding her bike and playing with her little sister and big brother – they often engage in imaginative role-play games.Holly is a great help around the camp kitchen with food preparation and She particularly loves helping with the dishes (we are encouraging this love). Bianca the baby of the family and the source of much affection and fun. She is simply lots of fun always smiling, laughing and entertaining the rest of the family. Bianca since learning to walk has been chasing after the ‘big kids’ as she affectionately calls Aaron and Holly. Since she was very little on days when I was home from work we would drop Holly and Aaron at kinder/school and shortly after Bianca would be asking, “Is it time to pick up the big kids?’ So Bianca will relish this opportunity to hang out and bond (more)with her older siblings who she adores. Bianca loves swimming and beach activities, she loves animals and birds and all living creatures. Simrenn – we are excited for when you come back. Thanks for the message. I am having a great time with my family. It is very hot here now we are at 80 mile beach below Broome. We have been driving a lot and Dad says we have driven nearly 10,000 kms. driving was from Kalgoorlie to Perth which took all day! Thanks Madelena we are all having a great time! Thanks we had fun at the Space Museum and visiting lots of different places and meeting lots of people. Looks great, we’ll be keenly following you! Jas and I are only a little green with envy! Enjoy, travel safe. Thanks we are having lots of fun! The whale shark was a bit spooky but he just cruised past us. We have seen so many amazing things in our beautiful country.